Lake Michigan is one of the five North American Great Lakes, and it is the only Great Lake to be located entirely within the United States, bordering the states of Michigan, Indiana, Illinois, and Wisconsin. Lake Michigan is the second-largest Great Lake by volume and the third-largest by surface area. 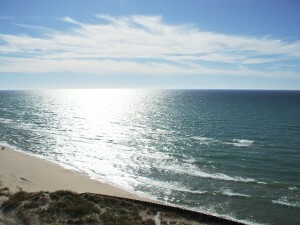 Lake Michigan, many not be aware, is often referred to as the “Third Coast” of the United States. The lake has hundreds of miles of sandy shore beaches that are visited from all across America and all across the globe. Lake Michigan is home to some of the most beautiful luxury lakefront properties anywhere in the United States. With hundreds of miles of sandy beaches and wild sand dunes, you can have your very own sandy shore beach in your front yard with nothing but the coast around you. The scenic views and sunsets that you get from a home on a Lake Michigan bluff are among the best views you will see anywhere in the United States. To see our listings of Lake Michigan real estate, see our full listings page. Its many sand dunes are unique sites in and of themselves. 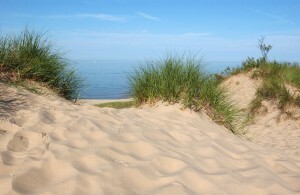 The sand dunes that are located on the east side of Lake Michigan are the largest freshwater dune system in the world. These dunes are visited yearly by thousands of tourists who come to hike, camp, and even ride off-road vehicles. The sand dunes at Silver Lake State Park, for example, are the only dunes area east of Utah where private motorized vehicles may be driven, making the shores of West Michigan not only a regional destination but also a national and international destination in the United States. There are several dozen state parks around Lake Michigan that seek to preserve and protect the shoreline for future generations of citizens and visitors. These parks are open for swimming, hiking, camping, fishing, and sometimes hunting or off-road recreation. 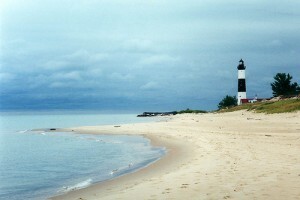 Lake Michigan also has a vast network of historic lighthouses that can be toured by the public. Lake Michigan, being a historic shipping and maritime body of water, has dozens of lighthouses that offer a window into the past. Some of the lighthouses are still operational, and some of them have museums that can be visited by the public and tourists. 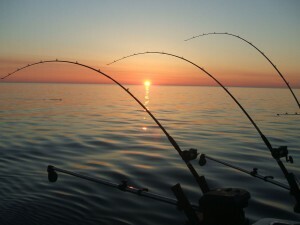 Lake Michigan is home to many fish species and commercial and recreational fishing are major activities to those on Lake Michigan and its surrounding lakes. Originally, the lake was home to lake whitefish, lake trout, yellow perch, panfish, large- and small-mouth bass, bowfin, and some species of catfish. Salmon were introduced into the lake and was such a success that it has created a large commercial fishing industry. If you are interested in purchasing a Lake Michigan waterfront home, contact us. We also showcase other lakefront properties across the Lake Michigan shoreline.